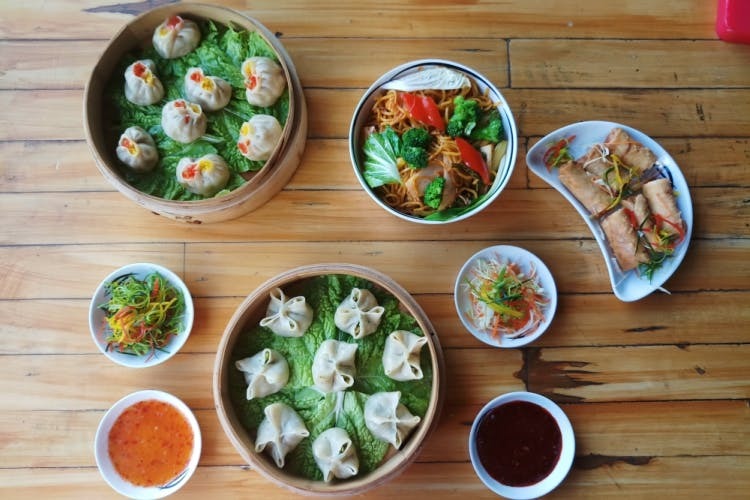 With a menu developed by the chefs at Gurgaon’s oldest and most iconic Asian restaurant, The Monk at Galaxy Hotel, Street Monk delivers hot and delicious street-style Asian food. Though the food is on the spicier side, each dish is unique in character and great value-for-money. We had the Shanghai Premium Veggies with Black Beans & Garlic Sauce and the Kung Pao Chicken with a side of steamed rice and hakka noodles and it was like revisiting all the Chinese restaurants we ate at as kids. The noodles can be had as is with Street Monk’s Sweet and Sour Sauce which can be ordered on the side. A great way to start a meal like this is with their selection of dim sums – they have 7 varieties to choose from and we loved the Five Spice Chicken and Cantonese Prawns ones the most. The true stars of the menu, however, are the Thai dishes – make sure you order extra kimchi! Pair their Chilli Garlic Fried Rice with Thai curries to really heat things up. The curries are a bit low on coconut milk but heady when it comes to pungency. The Thai Red Curry Chicken and the Thai Green Curry with Vegetables are the best of the menu. For this kind of pricing, Street Monk’s menu is a winner considering it’s been developed by hotel-trained chefs and you can taste that in the quality and flavour of the dishes.